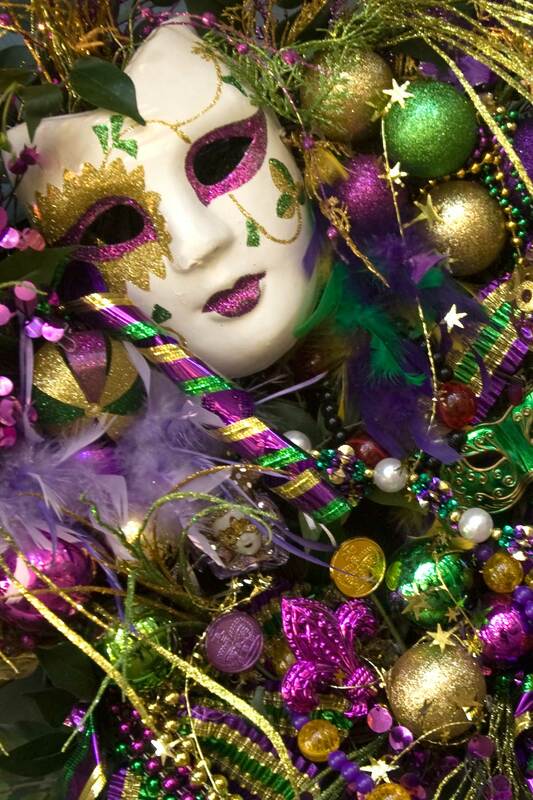 The colors of Carnival are purple, green and gold. Purple represents justice, green represents faith, and gold represents power. These colors can be found throughout New Orleans during the Carnival season. The sounds of marches, waltzes, jazz, zydeco and rhythm and blues are heard everywhere during Carnival. “If I Ever Cease to Love” is the title of the Carnival anthem. It may be played as a waltz or a march depending on the occasion. The one food that is reserved for the Carnival season is the King Cake, a ring-shaped French pastry decorated in purple, green, and gold. A small doll or bean is baked inside the cake. The person who finds the favor in their slice becomes the King or Queen and must host the next party. Other traditional foods such as turtle soup are served at the Queen’s Supper and other Carnival feasts.